Commercial drain maintenance services in Gillingham, Kent by the specialist team at JLH Drains including no dig repairs, CCTV surveys and pollution control. Providing drainage maintenance and repair services to homeowners and commercial businesses including restaurants, hotels, kitchens and letting agents, JLH Drains are your best choice for cost-effective and fast turnarounds in the Gillingham, Kent area. Working to the highest standards in safety and fully certified for street works and waterways access you’re guaranteed a comprehensive and effective result from JLH. Many of our customers worry about the cost and disruption of drain repairs; all that time digging things up just working out what the problem is… At JLH Drains in Gillingham, Kent we do things differently, using the latest technology to ensure nearly all of our repairs are carried out without excavations. Miniature CCTV cameras find the problem, blockages are removed with high pressure jet washing and cracked pipes are relined with tough epoxy resin applied with a remote system that can save up to 75% on drain repair costs! You can trust in JLH Drains for any excavation requirements precisely because we’ll do everything we can to avoid them; we take pride in giving our customers fast turnarounds at the minimum price and only excavate when there is no other choice. With a highly expert team from across Gillingham, Kent we’ll quickly trace the drainage problem and guarantee all excavation works are carried out as quickly, effectively and professionally as possible. Our drain re-lining service uses a well established, professional approach to ensure the best repair for our clients. A CCTV or sonar survey is used to identify the location of the fault, at which point we pump out all the liquids, remove any blockages and use a high pressure water jet to get the inside of the pipework really clean. Only once we’re happy with these results do we insert the inflatable tube covered in resin, carefully position it using a CCTV camera to guide us and inflate the tube for a really tight fit. The resin is left to fully dry before removal of the tube and a final CCTV inspection and test to make sure the finish is watertight and smooth. Most homes and businesses will suffer a blocked toilet, drain or sink at some point, it’s a common occurrence, what few people realise is how expensive repairs can be without a truly professional repair service. 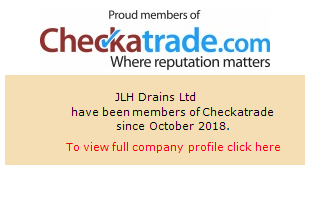 At JLH Drains in Gillingham, Kent we invest in the latest equipment to make repairs of blocked drains and toilets with a minimum of fuss and a fast turnaround.